Aperio is clean , creative and powerful multipurpose WordPress theme 2015 with incredibly flexibility with lots of options and variation. 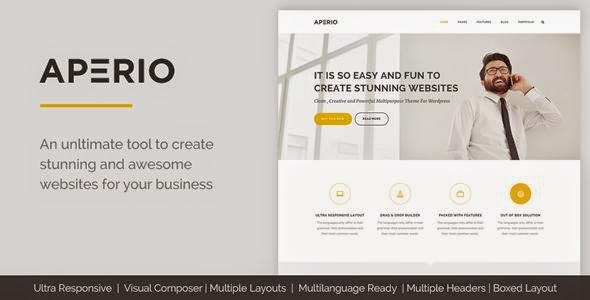 Aperio has included multiple header layouts, parallax slider, posts slider, revolution slider, powerful admin panel, 600+ Google font, easy font integration from premium font vendor websites and also with support to upload your own fonts and icons. Aperio is the best choice for you to create a business , personal portfolio , photography or a blogging website. Fully Responsive: Aperio is fully responsive and works perfectly on all screen sizes. Visual Composer for WordPress: We have included this very popular plugin with aperio so you can create complex layout just in minutes. Search Engine Optimized Aperio is SEO Friendly and fully optimized to work with popular sep plugin by yeast. Multiple Portfolios: We have included to different portfolio layouts to showcase your work , you can use the predefined layouts for single portfolio and also you can use visual composers for portfolio and create your own project page , we have also included two different visual composer project examples with our demo data. Item Reviewed: Aperio Powerful Multipurpose WordPress Theme 2015 9 out of 10 based on 10 ratings. 9 user reviews.